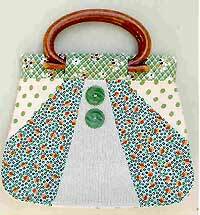 The Miso bag pattern by Melly & Me is approximately 12", including the handle and has fabric diagnonaly to add special style! Fabric 3 (knitted or substitute) 30cm x 25cm (12" x 10"). The bag shown used an old cotton jumper.